Let’s face it. We Americans are up to our eyeballs in stuff. I heard a statistic recently that 1 in 7 of us has at least one room in the house filled with stuff we never use. And, according to the Department of Energy, 25% of people with two-car garages have no room in the garage for their car, and 32% only have room for one. On top of that, one out of every 10 Americans rents an offsite storage unit, according to an article in the New York Times Magazine. No wonder storage has been the fastest growing segment of the commercial real estate industry over the past four decades. Clearly, it’s time for us to clear our clutter! This is the first in a 3-part series about how to clear your clutter and rediscover the joy of space. We’ve based it on the book, The Gentle Art of Swedish Death Cleaning: How to Free Yourself and Your Family from a Lifetime of Clutter, by Margareta Magnusson. While the focus is on giving you ideas to help your aging parents downsize, the techniques – and mindset – can be applied at any age to create an environment (and life) that is more organized and productive, healthier, and free of the burden of stuff. The hard part is getting started. Often parents are reluctant to give up cherished items that they hope to pass on to their children as a way to be remembered. And yet there are so many good reasons to do so. Most of the current generation has no interest (and usually no room for) collectibles and family heirlooms. Also having too many things around can be unhealthy (asthma and allergies) and can present safety issues (falling, lack of easy access). And, with fewer things you can be better organized and spend less time looking for items you’ve misplaced. According to one study, over the course of our lifetime, we spend a total of 3,680 hours or 153 days searching for misplaced items! If your parents have a storage unit, consider starting there. Most storage units contain stuff that we haven’t used or even thought about in years, so those items may be easier to part with. 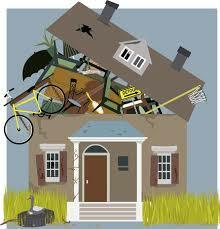 There are services such as Junk King and 1-800-Got-Junk? that can help with recycling and disposal. Another area to put at the top of your list is junk mail. Junk mail can be especially frustrating for older adults as its volume is overwhelming. Additionally, credit card solicitations can present a financial risk. 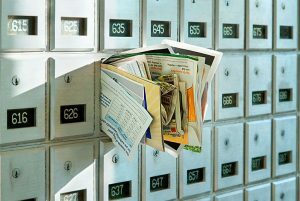 Ecocycle offers some tips on stopping junk mail, getting rid of unwanted coupons, catalogs, credit card offers, etc. It’s also a good idea in this process to ensure that you have your parents’ important papers identified and stored in a secure and accessible place. 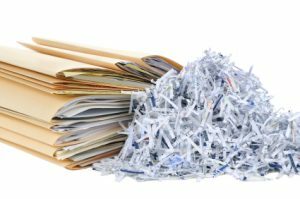 Shred paperwork with personal information that is no longer valid or needed. For some general guidelines on how long to retain records, go here. So…cleaning out the storage unit and stopping junk mail should get you started for this month. Next time we’ll give you some tips and resources about cleaning the closets. If your parents are ready to downsize or are preparing for a move and you would like some professional help or advice, please contact me at 408.318.0828 or minda@loveandorder.net.